Denny’s French Toast is a favorite French Toast of so many people. 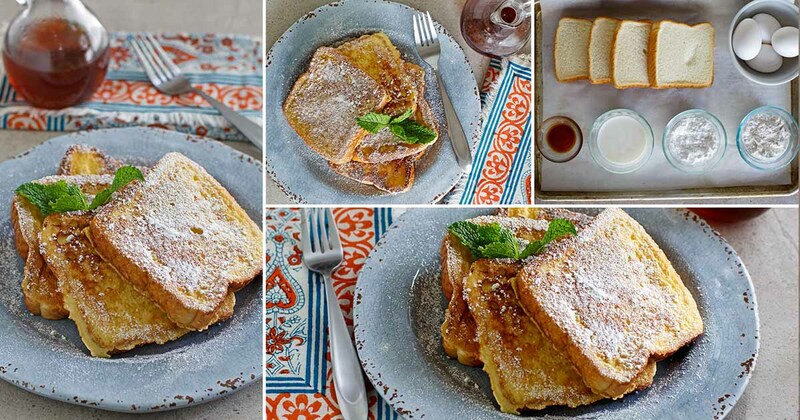 You can recreate the famous French Toast at home. In 1953, Harold Butler and a partner opened a donut stand and named it Danny’s Donuts. Butler made a promise: “To serve the best cup of coffee, make the best donuts, give the best service, offer the best value, and stay open 24 hours a day.” That one donut stand has been transformed into a restaurant chain with a slightly different name. There are now more than 1,700 Denny’s, and each one is dedicated to keeping Butler’s original promise. To read more about Denny’s, click here. Denny’s is America’s diner. It’s a homey place where you can sit back, relax and enjoy delicious, hearty breakfast fare and a steaming mug of freshly-made coffee. You can park yourself in a comfortable booth or take a perch at the counter. One of my favorite things to eat for breakfast is French toast, and one of my favorite French toasts is served at Denny’s. However, you don’t always want to go out for breakfast, so I am going to tell you how to make Denny’s French toast at home. Practically everyone who likes bread, milk, and eggs, loves French toast. But you may wonder how French toast came about. 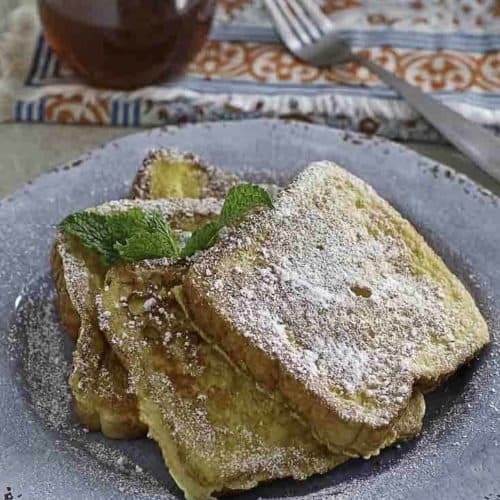 Contrary to what you might think, French toast was invented long before France existed as a country. This is not surprising as it was probably first created as a way to use up stale bread. The earliest reference to what we now call French toast dates way back to Roman times. 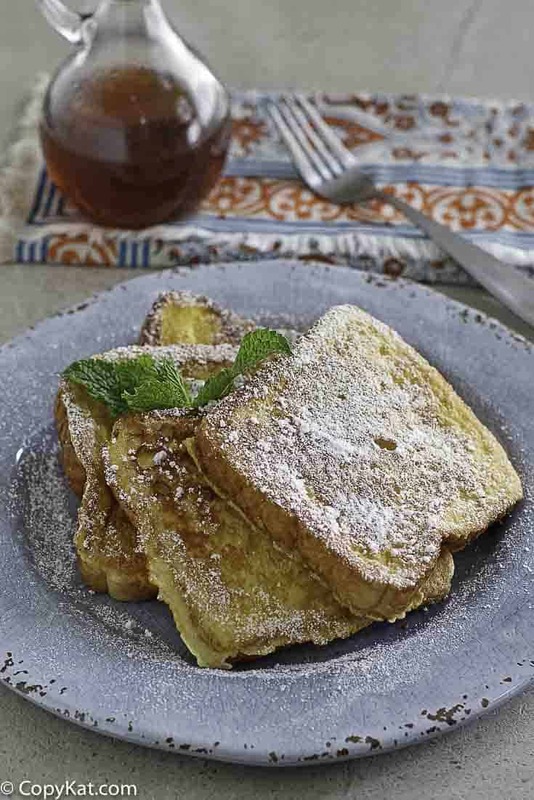 If you would to learn more about the history of French toast, click here. By old bread, I don’t mean bread that is too old! If you have moldy bread, you should just throw it out. Serve this French toast with a few pieces of fresh fruit – blueberries are perfect. If you like this recipe, here’s another delicious Denny’s breakfast treat that you can try. You can make Denny's French Toast just like they do with this recipe. In a medium-size bowl beat together the eggs and the milk. Then beat flour, powdered sugar, vanilla, and salt into the egg mixture. Strain the custard mixture using a wire mesh strainer into another bowl. Heat a skillet or a griddle to about 350 degrees. Brush the skillet/griddle with butter. Place the bread into the custard mixture, then flip over the bread, and then place the bread onto the hot cooking surface. Cook for 1 to 2 minutes on each side. The bread should be golden in color when cooked through. Remove from skillet. Cut the toast diagonally, and sprinkle with powdered sugar, and top with butter. Delicious! It would dirty the blender but I think I’d combine the custard ingredients in a blender next time. I’m going to make French toast this way from now on. So good with raspberry topping and creme freche! Oh great idea about the blender! I’ve never thought of adding Powdered Sugar to the egg mixture. A dash of regular granulated sugar, yes. The flour, too, Who-da-thunk!! I’m definitely trying this next time, cause I know that you know what you’re doing! Are the Texas toast frozen ? I may be dense here, but why does the egg and milk mixture need to be strained, and why into another bowl?? It strains out undissolved lumps of flour and bits of protein from the egg whites from the batter. This makes the batter more uniform. but isn’t the strain step before the add flour step? Thank you Kay, you are right. Make a custard by beating together the eggs and the milk in a medium-size bowl. Strain the custard into another bowl. Beat in flour, powdered sugar, vanilla, and salt. Heat a skillet or a griddle to about 350 degrees. Brush the skillet/griddle with butter. I hope my interpretation of this great recipe may clarify some questions about it’s preparation. Place a slice of bread into the custard mixture coating one side of the bread. Flip over the bread, coating the other side of the bread. Place the bread onto the hot cooking surface. Cook for 1 to 2 minutes on each side. The bread should be golden in color when cooked through. Remove from skillet. So Ross, I’m curious as to why you felt the need to restate the recipe. I wasn’t super clear initially, and Ross made a clarifying statement. Thank you! I hope you enjoy the French toast!